The story begins aboard the 1929 round-the-world flight of the German airship, LZ-127 Graf Zeppelin. 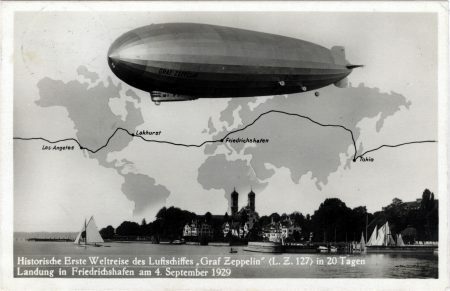 A truly international contingent of media and privileged guests are enjoying the lavish facilities of Germany’s luxury airship as they complete their ground-breaking three week journey around the planet. Among the media contingent is the recently knighted Australian celebrity explorer and cinematographer, Sir George Hubert Wilkins, who is reporting for the vast Hearst newspaper network. In the spirit of international co-operation, the guests enjoy polite conversation and genuine camaraderie. German, Soviet, Japanese, American, British, Spanish, Swiss and French guests all gather politely for dinner and relaxation in the lounge during the long voyage. The two Japanese military observers, Lt. Cdr. Ryunosuke Kusaka and Lt. Cdr. Fujiyoshi warm to the amicable Australian and all become good friends. The group are feted like royalty when the airship arrives in Tokyo. Fast forward ten years and Wilkins is on a thinly disguised espionage mission and meeting with senior Japanese diplomats in the Raffles Hotel, Singapore. 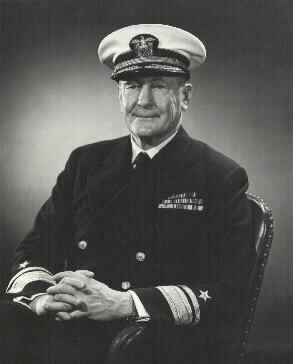 Wilkins had already been in China, Japan and Asia gathering information and it was clear to him that war in the Pacific was inevitable. 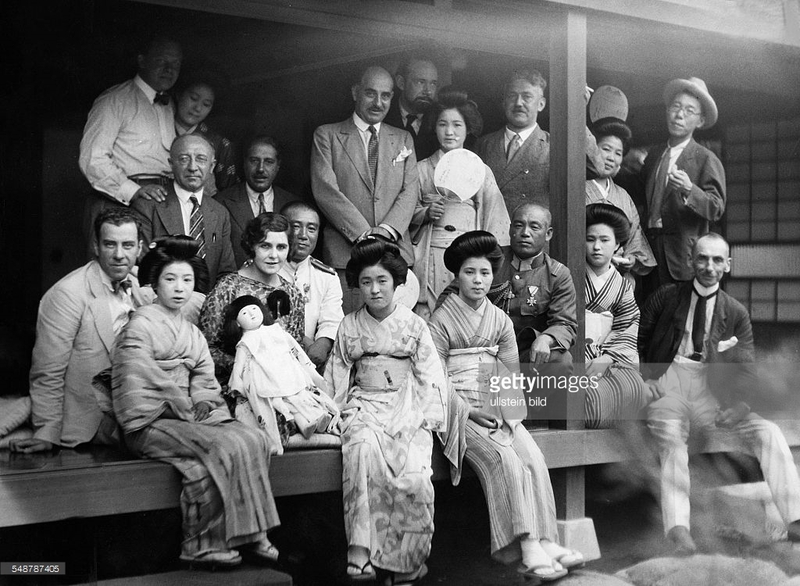 His Japanese contacts had been very forthcoming with aircraft production data and information in 1929, but now in 1940, they were convivial, but tight-lipped on such matters. Between times, Wilkins had attempted to take a modified WWI submarine beneath the polar ice cap. The 1931 so-called ‘Nautilus’ mission ended in failure and embarrassment for Wilkins. 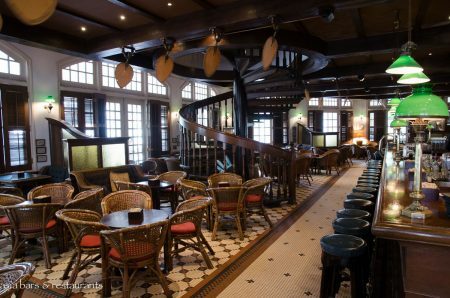 In the famous bar in the Raffles Hotel Singapore, Wilkins is enjoying drinks with the Japanese Consul General, who he had met ten years prior in Tokyo, when the conversation becomes ‘fluid’. His drinking pal suddenly drops a most intriguing piece of information. Given Wilkins’ excellent personal connections, the idea was not as preposterous as it sounded, and he did go ahead and make his report. Sure enough, his warning was ignored or discounted as implausible. Either way, Wilkins warned the US of an impending attack on Pearl Harbor at least 12 months in advance. Ironically, his Japanese friends would go on to play important parts in the attack. 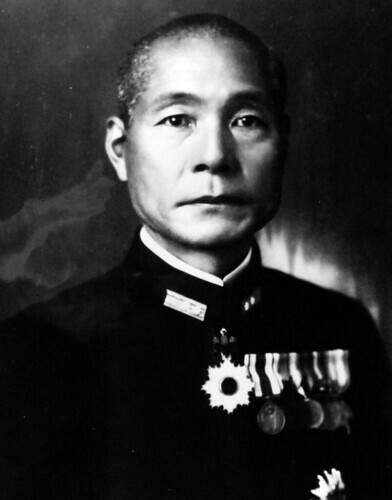 Ryunosuke Kusaka was named the chief of staff of the Japanese Navy Combined Fleet and was critical in the planning of both the Pearl Harbor and Midway attacks, while Vice-Admiral Akira Fujiyoshi rose to Head of Aviation for the Japanese Imperial Navy. Both survived the war. 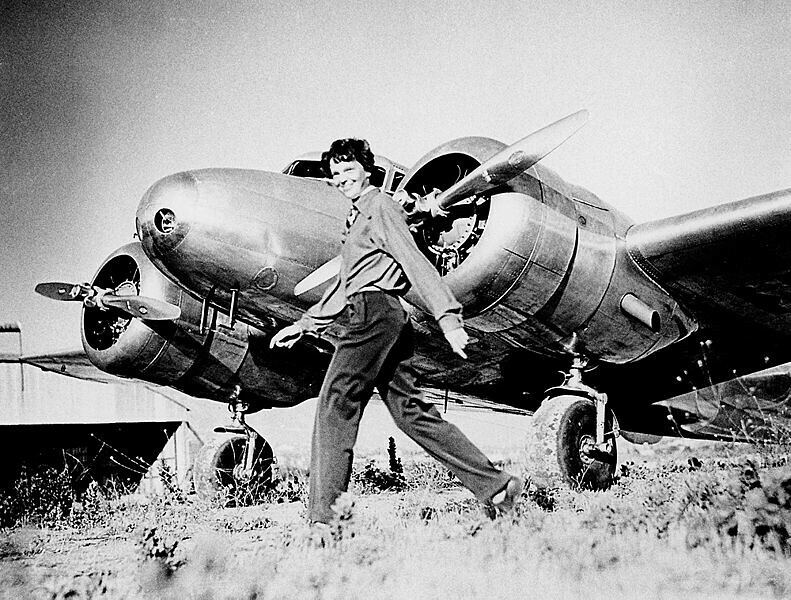 The Amelia Earhart mystery has gripped the imagination for almost 80 years and despite numerous searches and millions of dollars, no conclusive evidence has yet been found. Many theories have been put forward over the years and just as many discounted, but one just keeps coming back. The idea that Earhart was forced down and captured by the Japanese in the Marshall Islands is as unpalatable as it is incredulous. But one researcher, Mike Campbell, makes a compelling case for this proposition. To refresh our memories, it was early in the morning of July 2nd, 1937. Earhart and her navigator, Fred Noonan, were flying their specially-modified, twin-engined Lockheed Electra 10E on the final stages of a much-publicised round-the-world flight and supposedly heading to remote Howland Island, 800 Nautical Miles beyond Majuro in the Marshall Islands. Popularly held accounts attest that Earhart struggled with her radio direction finding (RDF) equipment while attempting to contact the specially-located US Coast Guard ship, Itasca, which was supposed to guide her to the tiny 2000m long island where an airstrip had been prepared especially for her. In a flurry of garbled and confused radio messages in both voice and morse code, Earhart apparently believed she had arrived at Howland, but could not see either the island or the Coast Guard vessel and by 9am, she was silent and never seen or heard from again. Comprehensive and expensive searches were conducted by the US Navy and Coast Guard, but by January 1939, Earhart was officially declared dead. In recent years, ardent investigators have revived an alternate theory contrived at the time, that the plane, critically low on fuel, had ditched near Gardner Island (now Nikumaroro in Kiribati) 560 km southeast of Howland. These researchers, notably The International Group for Historic Aircraft Recovery (TIGHAR), posted on their website “... not only was a safe landing obviously feasible (on Gardner) but we found artifacts that were undeniably aircraft wreckage in the island’s abandoned village.” Despite years of persistence and tantalising clues, TIGHAR have yet to prove the connection to Earhart and their quest continues. Even though there are several discrepancies in the competing account, it’s a compelling story nonetheless supported by numerous witnesses from the time of their alleged capture by the Japanese (as spies) through to their supposed transport to Saipan and eventual execution. Sure, it’s a decent conspiracy theory, but one that will not go away. One is drawn to wonder why such effort is expended in decrying this version of events and what any interested parties might be seeking to hide. Let’s consider the scenario, first postulated by researcher and author, Fred Goerner in his 1966 bestseller, The Search for Amelia Earhart. In 1937, the Japanese Empire had control of the Marshall Islands, having been given them by the League of Nations as a protectorate after the defeat of Germany in WWI. Jaluit was then the capital and the Japanese expanded the settlement, as they did elsewhere in the Central Pacific, by encouraging civilian migration from Japan. Things were going fine for a while, but in the early ‘30s Japan began to quietly build its military presence in these territories in contravention with its agreement with the League of Nations. Chuuk in Micronesia, for example, was expanded to a huge military base to rival Pearl Harbour. Robert Reimers: "It was no mystery. Everyone knew it." 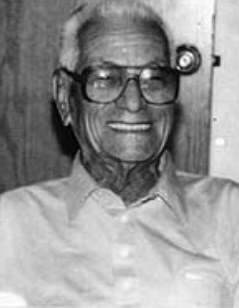 One of Marshall’s most prominent modern pioneers, Robert Reimers, born on Jaluit in 1909, recalls the increased activity in his home region in a 1991 interview with journalist and Earhart researcher, Bill Prymak. It follows then that the US government would take particular interest in the ambitious empire, especially after Japan’s military intervention in China and clear signs it was building its armed forces elsewhere in Asia and the Pacific. 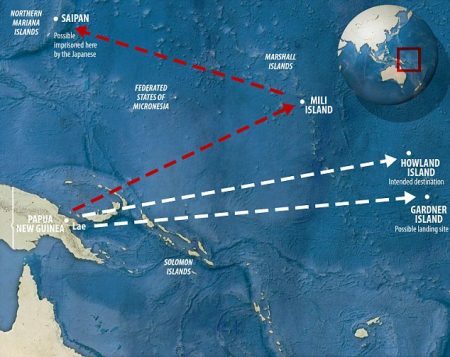 What if an otherwise innocent civilian flight could be diverted to reconnoitre these secret islands and determine if Japan was demonstrating hostile intentions to its neighbours, the US included? It was well known that Earhart was short of funds after the first (east to west) attempt at the round-the-world flight ended in an expensive accident in Hawaii. But she miraculously acquired enough money to relaunch her attempt just two months later when the flight took off from Oaklands California in the opposite direction. For the final and most difficult section across the Pacific, the aircraft was equipped with advanced RDF equipment and, as mentioned earlier, had the support of the US Coast Guard and a specially built airstrip on remote Howland Island. Proponents of this theory have suggested that was quite an investment for a pair of “stunt flyers”. Perhaps Earhart was trying to find Howland after a major diversion past Jaluit to inspect Japanese installations on islands in that area. There are a couple of varying accounts of what happened at this time. One says the captain of the Japanese aircraft carrier Akagi was ordered to send up a fighter to “shoot down” a twin-engined aircraft in the area. Whether forced down by a fighter or lack of fuel and in order to stay consistent with eyewitness reports later, the aircraft must have made some kind of controlled landing that left it more or less intact. Eyewitness accounts say the aircraft came down on or near Mili Atoll, a short distance by air from Jaluit. The Bilimon mentioned above was a respected medical orderly on Jaluit and recalls treating a man he believed was Fred Noonan for an injury to his leg. Just to make matters more interesting, there is an eyewitness account by then 11yo Josephine Blanco who attests the aircraft landed in a restricted military zone on Saipan and the two aviators were immediately arrested and executed as spies a few days later. She told her story to Family Weekly Magazine in July 1960. When Josephine tried to tell her parents, she was quickly silenced and told to forget what she had seen. While there are parallel accounts of how Earhart and Noonan were supposed to have ended up on Saipan, all these versions agree that both died on Saipan. Noonan, as a male, was apparently beheaded either soon after arrival or after some years in a cell at the old Japanese jail with Earhart in a nearby cell. Other eyewitnesses say she was lead out of the jail and shot by a firing squad just prior to the US invasion in mid-1944, while other account claim she perished from dysentery. "....One day I am working on the farm and I see three Japanese motorcycles. Amelia Earhart is in a little seat on the side of one motorcycle. She is wearing handcuffs and she is blindfolded. I watch and they take her to this place where there is a hole been dug. They make her kneel in front then they tear the blindfold from her face and throw it into the hole. The soldiers shoot her in the chest and she falls backwards into the grave..."
To further compound the intrigue, liberating US soldiers claim to have seen a plane resembling the Electra removed from a hangar at the Aslito Airfield and torched at the orders of some higher authority. Another soldier blew open a safe he’d found in the rubble thinking he would find money or valuables. Instead, so he says, he found Earhart's briefcase full of her documents. When one considers the full implications of the Saipan theory, it leads to premise that Earhart and Noonan had, either through poor skill on their part or good intelligence on the part of the Japanese, allowed themselves to be captured during their spy mission. A cover story was created around the Howland Island version in order to preserve the reputation of Roosevelt’s government and avoid any diplomatic backlash with the militaristic Empire of Japan. Admiral Chester Nimitz: "...Earhart and her navigator did go down in the Marshalls..."
And Nimitz was not alone. 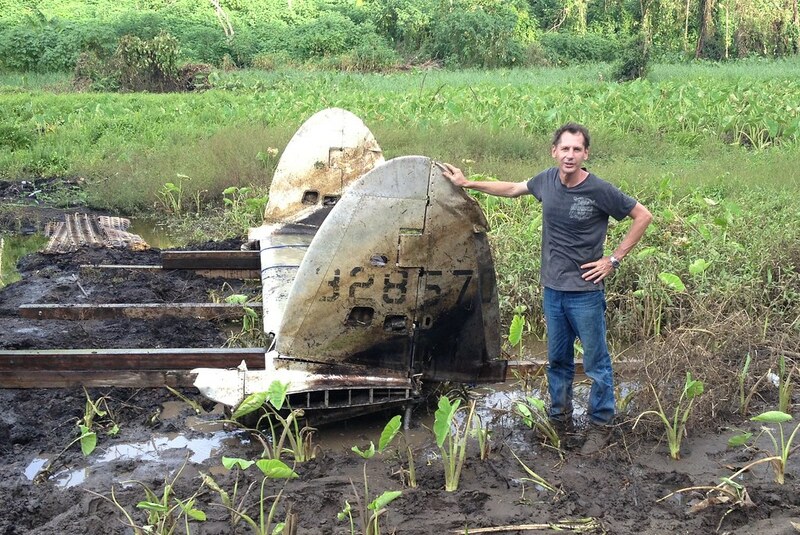 Historic aircraft wreck found. Is this the Wildcat of US ace, James E Swett? On my last trip to the Solomon Islands in October, I was fortunate to make my first dive on some of the historic aircraft wrecks that litter the harbour near Tulagi in the Florida Islands. I was introduced to Bob Norton, an Kiwi ex-serviceman and the new proprietor of the Raiders Hotel in Tulagi, a quaint and peaceful waterfront hotel in the little former British pre-war colonial capital in the Florida Islands, across Iron Bottom Sound from Honiara. 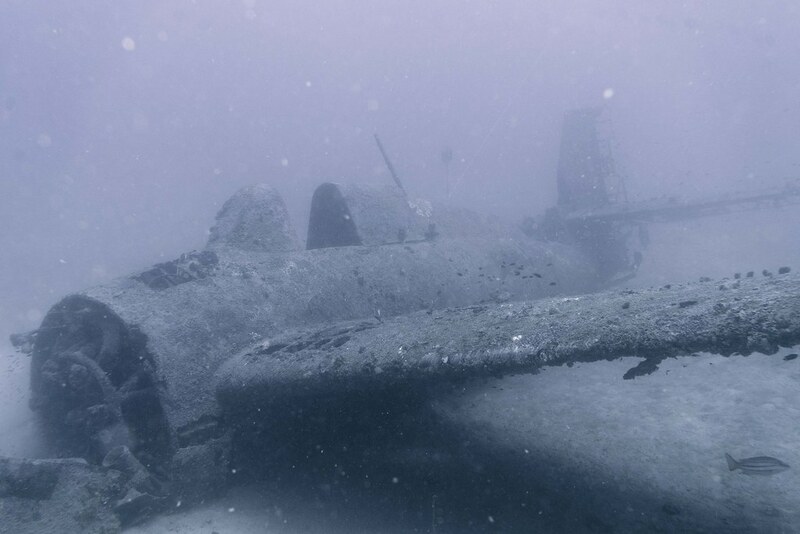 The well-known wrecks of large ‘Mavis’ flying boats sunk on 7 August 1942 at the onset of the Guadalcanal campaign are well documented and frequently dived, but Bob was excited to show me a wreck of a Grumman F4F-4 Wildcat only recently discovered. In remarkably good condition, the Wildcat lies in 40 metres of water and bears hallmarks of Swett's account of the action including a jettisoned canopy, broken nose and damaged wings. What is particularly noteworthy of what has been dubbed ‘The Gavutu Wildcat’, is that it is believed to be the aircraft of 1st Lt James E. Swett, one of the US Marine Corps most decorated pilots. 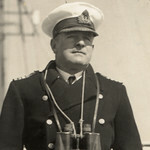 WWII historian and shipwreck researcher, Ewan Stevenson, who was aboard the HMNZS Resolution under the command of Lt. Cdr. Matt Wray when the sonar scan revealed the aircraft, told me via email that while the wreck is yet to be absolutely verified, he is confident his theory will be borne out. Aviation artist, Roy Grinnell's impression of that fateful day. His ammunition expended and his plane shot up, Swett was forced to ditch but was rescued, recuperated and returned to service, surviving the war and passing away at the ripe old age of 88 in 2009. I intend to follow up on this and will report any updates. 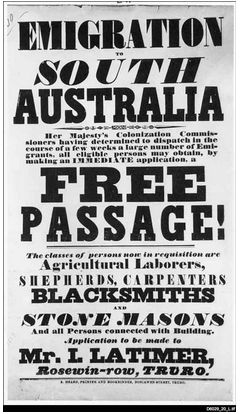 In the meantime you can contact Raiders Hotel to arrange a dive on this exciting new find. Here is Swett telling his own story with a very cool computer reenactment. The Grumman F4F-4 Wildcat was an American carrier- and land-based fighter aircraft that began service with both the United States Navy and the British Royal Navy in 1941. While not the fastest or most maneuverable aircraft in the sky at the time, the Wildcat could pack a punch. 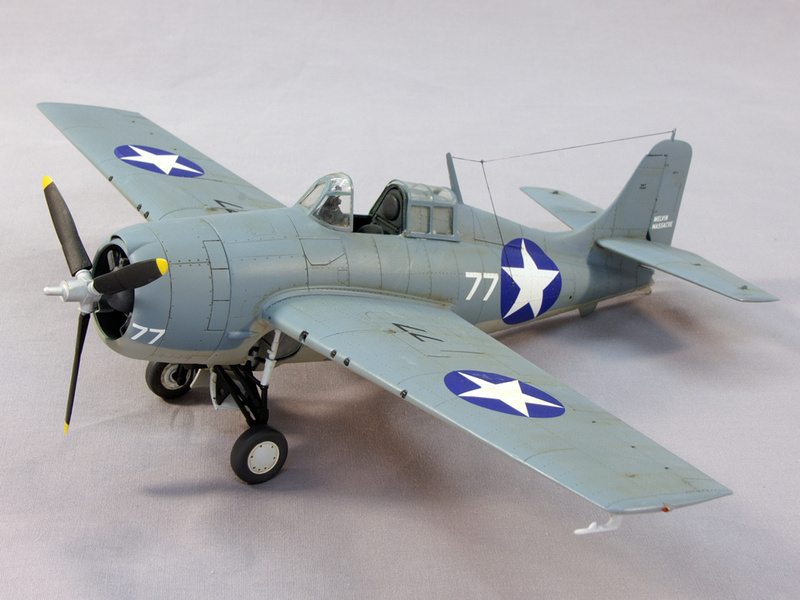 By the end of WWII, most units had been upgraded to Corsairs. Guadalcanal War Mystery Solved. Pilot’s remains recovered. For Solomon Airlines magazine. August 2014. 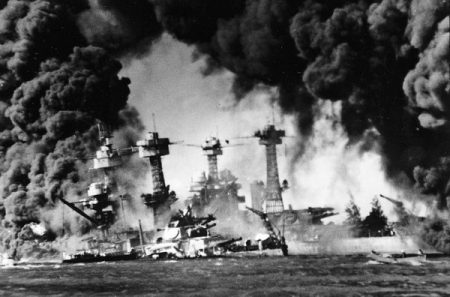 The Solomons continue to throw up mysteries from the turbulent years of WWII. 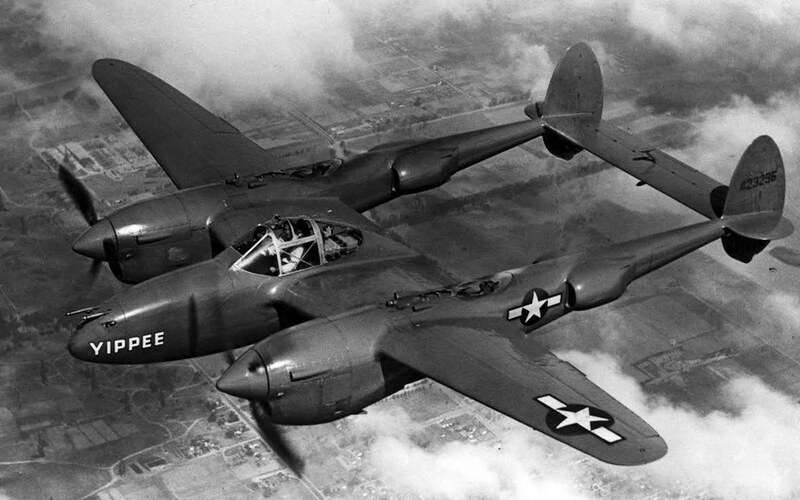 One mystery solved recently has been with the rediscovery of a P-38 Lightning fighter that crashed on 5 June 1944 while on approach to what was then known as ‘Fighter 2’ (Kukum Field). This airstrip is now the golf course near historic Henderson Field, the main airport from which Solomon Airlines operates. 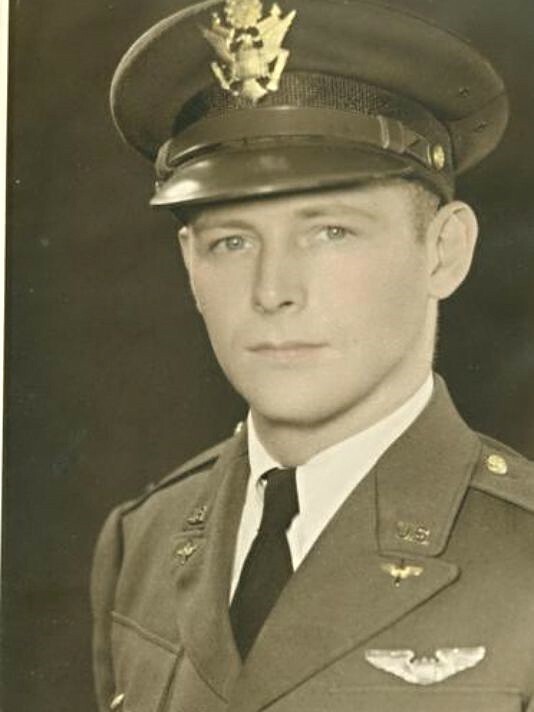 According to records from the time, the pilot Major Peyton S. Mathis, Jr (who was commanding officer of the 44th Fighter Squadron and a decorated pilot) was returning from an aborted mission to bomb Poporang Island in the Western Province. One engine failed during the return flight and after allowing the rest of his planes to land first, Peyton was seen to crash while on an easterly heading to make a landing. For reasons that remain a mystery, Peyton’s aircraft flipped and crashed into swampy land six miles from the strip. Despite concerted attempts to recover Peyton’s body from the submerged wreck, salvage was abandoned and the wreck site lost to time. In 2012, a local farmer struck metal while clearing land and called in local relic hunter, Jurgen Markwarth who, along with his brother Kurt, have been collecting war relics since childhood and have an impressive collection in their yard at Renadi, near the airport. The recovery of Major Mathis’s remains was partially successful and have been collected by the Joint POW/MIA Accounting Command (JPAC) based in Hawaii. For the last 12 months, the Markwarth brothers have been slowly recovering the aircraft with the hope that it might be restored at some time in the future. Only the more adventurous travellers make it to remote Gizo in the Western Province of the Solomon Islands. It's a magical place with some of the world's best fishing as well as wreck and reef diving. From Gizo you can venture a further 10 kilometres to a minuscule dot shown on most charts as either Kasolo Atoll or Plum Pudding Island. This sandy speck is better known in popular mythology as Kennedy Island – the place where a then 26 year old US Navy Lieutenant John F. Kennedy, commander of the motor torpedo boat PT109 and future President of the United States, together with ten of his crew, waded ashore in pitch-blackness after their boat was rammed and sunk by the Japanese destroyer Amagiri on the night of 2 August 1943. For decades, South Pacific adventurers have laid claim to finding and even salvaging the wreckage of PT109. But their assertions are in fact their imaginings. What little remains of PT109 lies at an impossible depth of 374 metres, 4km off Kasolo. 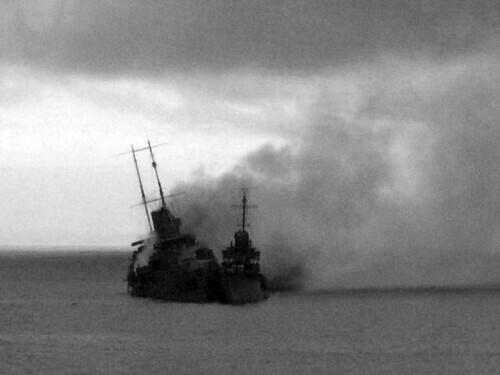 On 1 August 1943, PT109 had been one of fifteen PTs sent from the US Navy's base on Rendova Island to harass a Japanese convoy that had dropped reinforcements and supplies on the nearby and much larger Kolombangara Island as Japan tried to shore up their retreat after the end of their disastrous Guadalcanal campaign earlier that year. But in the inkiness of that moonless night, the 2000 ton Amagiri, travelling at high speed, rammed the little 25m PT109, splitting her lengthwise and setting her fuel tanks ablaze in a massive fireball. 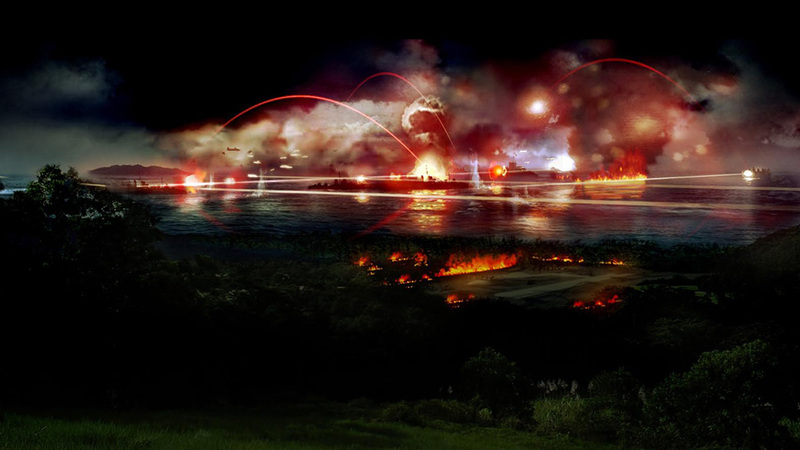 Artist impression of the collision between IJN destroyer Amagiri and PT-109. Remembering the actual event occurred in the dark of night. Two men died instantly in the violent collision. The stern section sank quickly, leaving the forward section afloat with the surviving crew clinging on for dear life amid a sea of flames. Such was the ferocity of the impact, that the rest of the flotilla left PT109 for dead and headed full speed for base. With rescue fast becoming a forlorn hope, Lt. Kennedy and the survivors abandoned the sinking bow section and swam and drifted toward Kasolo – which locally means Gods of Paradise, and it must have seemed like salvation to the exhausted and hapless sailors. In an extraordinary feat of endurance, the injured Kennedy had towed one badly injured seaman the entire four kilometres with the strap of his life vest clenched in his mouth. Some accounts suggest that the PT109 crew were 'caught napping' when the Amagiri sliced her in two. Other accounts suggest that Amagiri was only aware of the collision after the fact, but witnesses also say that her commander, Lt. Cmdr. Kohei Hanami, made a deliberate effort to ram the allied patrol boat. 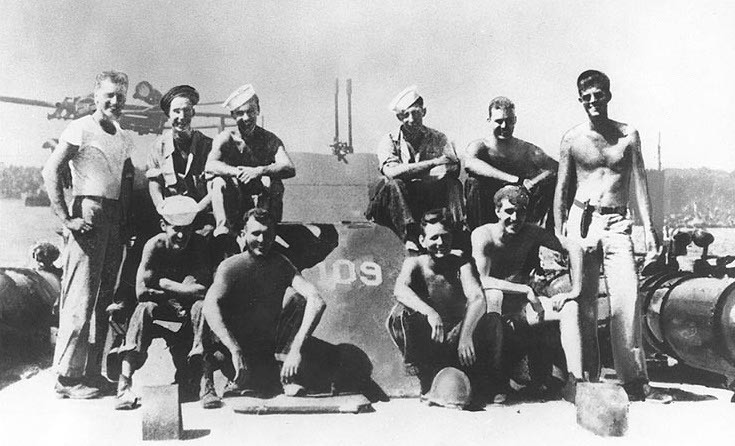 Crew of PT-109. JFK standing far right. After a week of foraging the tiny atoll offered no more water or food, so the group then swam two kilometres south to Olasana Island, from where Kennedy and crewman George Ross swam another kilometre south to larger Naru Island in the hope of finding American troops. 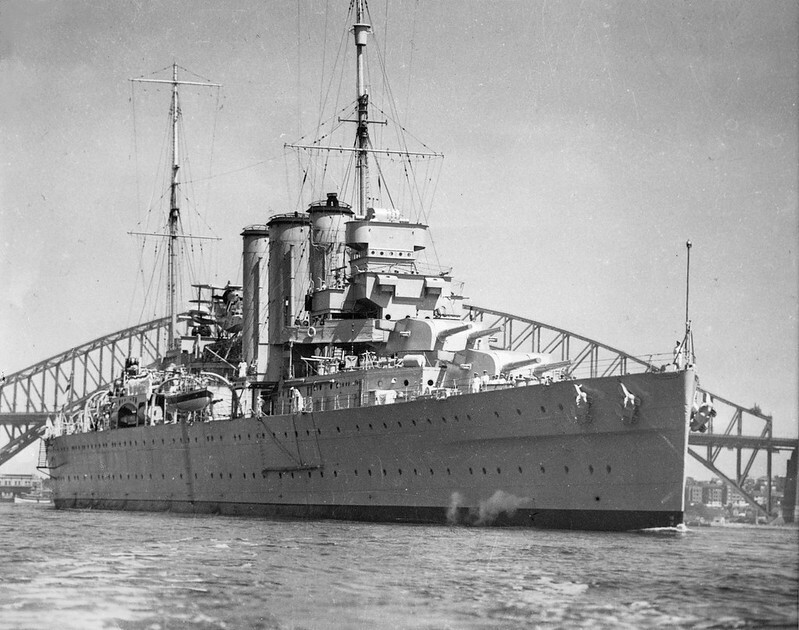 But they were surprised to be met instead by two villagers who were working secretly behind enemy lines alongside the Australian Coastwatcher, Reg Evans, who had seen the collision days earlier and been searching for survivors. Kennedy needed to get a message to his base on Rendova, now 60 kilometres away, and one of the villagers, Biuku Gasa came up with an ingenious idea. He found a green coconut and showed Kennedy how to scratch a message into its surface with a piece of sharpened sea-shell. Gasa and his teenage offsider, Aaron (Eroni) Kumana, then paddled their canoe all the way through dangerous waters to Rendova with the unusual coconut message and, under cover of the next night's darkness, a PT was summoned by Evans to come rescue Kennedy and his crew. American dive-holiday operator, Danny Kennedy (no relation) has lived in Gizo for more than 30 years and joined the National Geographic team led by Dr Robert Ballard, famous for finding several long-lost wrecks including the Titanic and Bismarck. The team finally found the few remains of PT109 in 2002. Danny told us when we visited him in Gizo that despite all the claims by others, all that was sighted by Ballard's ROV (Remotely Operated Vehicle) was a brass torpedo tube in 374 metres of water, and possibly a torpedo. Being of timber construction all else had succumbed to the sea, or disappeared under sand and coral debris. The ROV had nudged the torpedo tube but was unable to move it, suggesting it was still attached in some way to the wreck of PT109. 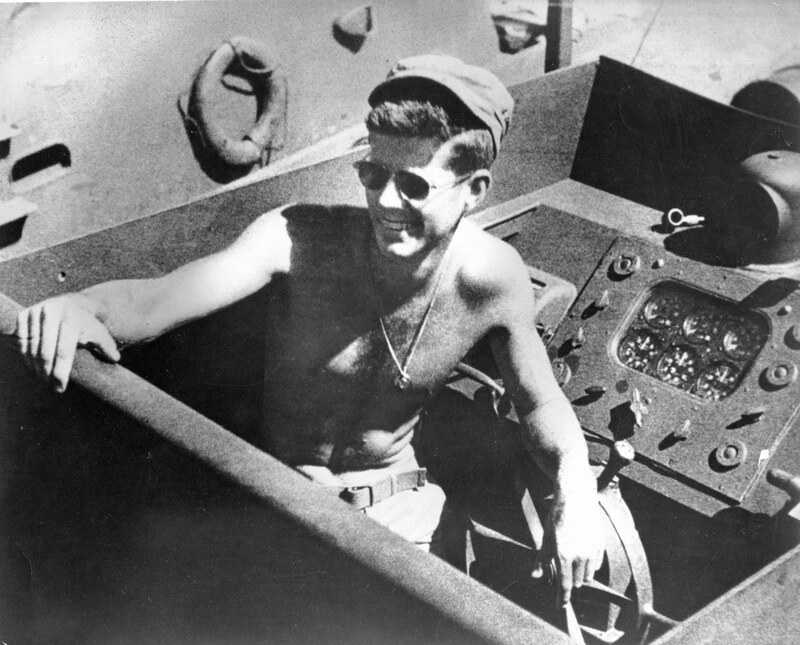 Neither Ballard nor Kennedy will reveal the exact location of PT109, saying they respect it as a war grave. In any case, it's way too deep for scuba divers. In a heartwarming footnote, Kumana appeared in the National Geographic documentary and had his house paid for by the Kennedy family, National Geographic and other benefactors. He passed away last year at the ripe old age of 96. To be released in October, this thrilling, moment-by-moment account describes in fresh detail the famous WWII events and John F. Kennedy’s heroic actions that saved his crew and is also a fascinating examination of how that extraordinary episode shaped the future president’s life. 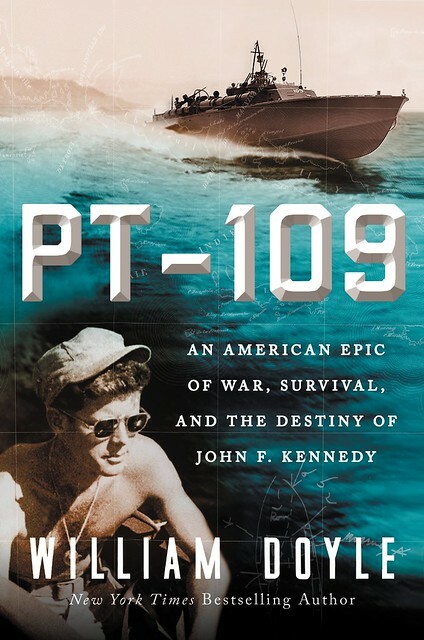 Drawing on new information from the American rescuers and recently released archives in both Japan and the U.S., PT-109 recounts this event in breathtaking detail and explores the incident’s remarkable aftermath on JFK’s life and legend. The author, William Doyle reveals that, while the incident transformed JFK into a “war hero” and helped propel him to the U.S. Senate and the White House, the wounds he suffered during that harrowing week continued to haunt him, physically and psychologically. William Doyle will revisit the Solomon Islands in July to see first hand many of the significant WWII battle sites while on assignment for the New York Times.